As you probably know, the USB 2.0 ports can deliver up to 500 mA that means about 2.5W. But sometimes you might need more power to connect an external HDD or other peripherals and the USB ports just cannot deliver enough current. In this case you can buy USB hubs that have an external power adapter required to boost the power or you can build a simple or complex circuit that can do the same thing. 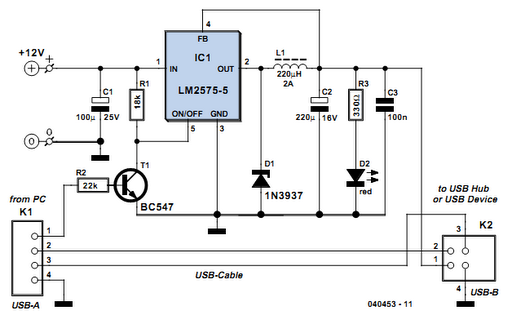 We are providing a very simple design involves the use of the 7805 voltage regulator that can deliver 5V and 1A. The USB serial bus can be configured for connecting several peripheral devices to a single PC. It is more complex than RS232, but faster and simpler for PC expansion. Since a PC can supply only a limited power to the external devices connected through its USB port, when too many devices are connected simultaneously, there is a possibility of power shortage. Therefore an external power source has to be added to power the external devices. In USB, two different types of connectors are used: type A and type B. The circuit presented here is an addon unit, designed to add more power to a USB supply line (type-A). When power signal from the PC (+5V) is received through socket A, LED1 glows, opto- diac IC1 conducts and TRIAC1 is triggered, resulting in availability of mains supply from the primary of transformer X1. Now transformer X1 delivers 12V at its secondary, which is rectified by a bridge rectifier comprising diodes D1 through D4 and filtered by capacitor C2. Regulator 7805 is used to stabilize the rectified DC. Capacitor C3 at the output of the regulator bypasses the ripples present in the rectified DC output. LED1 indicates the status of the USB power booster circuit. Assemble the circuit on a general purpose PCB and enclose in a suitable cabinet. Bring out the +5V, ground and data points in the type-A socket. Connect the data cables as assigned in the circuit and the USB power booster is ready t o function.